As 2017 commences, the start of a new year is often a good time to consider what changes, developments and news stories we might expect to blog about in the next twelve months. For scientists, including those who specialise in the Earth sciences, 2017 will no doubt be filled with exciting discoveries. The team at Everything Dinosaur has compiled a list of predictions, trying to guess what the next year will bring, it’s just a bit of fun, we shall see how things turn out in another year likely to be remembered for some remarkable fossil discoveries. A New Epoch – Arise the Anthropocene! 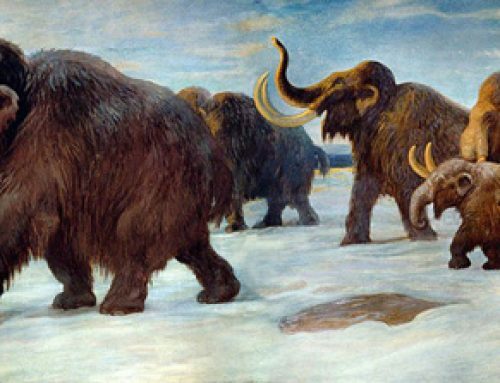 The work of the Anthropocene Work Group (AWG), will once again enter the scientific spotlight as the debate regarding the introduction of new geological epoch to mark the trend in global warming “hots up”. Our forecast, the 1950’s could be formally recognised as the start of the Anthropocene. Non-biodegradable plastics and other debris on a beach – the impact of our species on the planet. More Mini Dinos – The “Microsaurs” are Coming! The very biggest dinosaurs (see next prediction), might get all the media attention, but team members at Everything Dinosaur foresee that more fossil evidence will emerge indicating a hither to virtually unknown type of dinosaur – very small Theropods, not much bigger than a mouse. 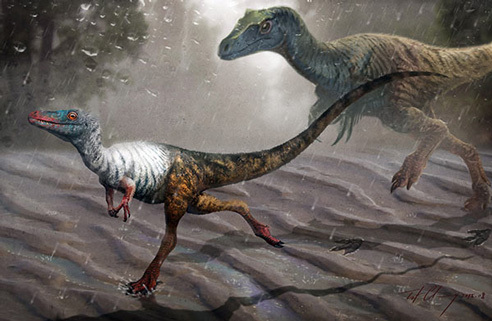 Tantalising evidence has emerged in recent years of tiny, bipedal dinosaurs that occupied an invertebrate hunting niche amongst the leaf litter of Mesozoic forests. Small woodland animals generally have a very low fossil preservation potential and the delicate bones of such small creatures would be, in all likelihood, too fragile to survive fossilisation in all but the most perfect of geological circumstances. However, improved CT scanning technology and a greater focus on the hunt for micro-fauna might just mean that 2017 becomes the year of the “Microsaur”! From the sublime to the ridiculous. 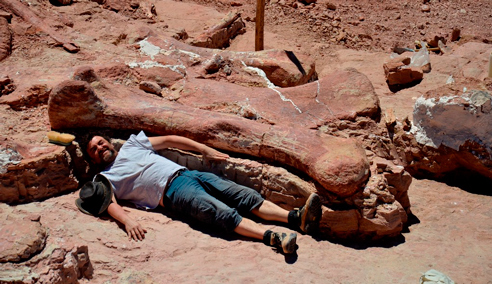 Early last year, the American Museum of Natural History erected a life-size cast of the largest dinosaur yet discovered, a huge 37-metre long giant from South America. The dinosaur, a Titanosaur, is so large that it is just a bit too big for its new home the Wallach Orientation Centre on the museum’s fourth floor. It’s head and neck extend out towards the visitor lifts. Despite having been on public display for nearly a year, the fossilised remains of this Cretaceous monster have yet to be formally described. We predict that “Enormosaurus” will get a binomial scientific name in 2017. In January 2016, Sir David Attenborough narrated a remarkable documentary all about this huge plant-eater. With the arrival of the eagerly anticipated “Dinosaurs of China – Ground Shakers to Feathered Flyers” exhibition in the summer of 2017, Chinese dinosaurs are going to be very much in our thoughts but expect new research into feathered Theropods from China to hit the headlines this year as well. The exhibition, which starts in July is a three-way partnership between the University of Nottingham, Nottingham City Council and the Chinese Institute of Vertebrate Palaeontology and Palaeoanthropology. Expect the likes of Gigantoraptor and Mamenchisaurus to cause a bit of a stir in the East Midlands. Picture Credit: BBC Planet Dinosaur television series. Plans are well advanced for a new website from Everything Dinosaur and we predict that it will go live in the early spring of this year. It has lots more interactivity and it is mobile device friendly. It should be live in time to welcome the myriad of new prehistoric animal models Everything Dinosaur intends to introduce over the next twelve months. The new website from Everything Dinosaur. Sadly, we also expect this year to feature several news stories and reports of deliberate damage to fossil sites and fossils from thoughtless collectors. Stories of the deliberate damage and vandalism are becoming more commonplace and with the strong “black market” for dinosaur fossils driving demand, we are bracing ourselves for having to write a number of articles this year that involve damage to valuable scientific specimens and important fossil-rich locations. Last but not least, our final prediction for 2017 is that somewhere around the world, perhaps in Canada, Portugal or in India, a series of dinosaur eggs and fossil nests will be discovered. A number of nest sites are known but dinosaur eggs and the potential embryos that they might contain remain exceptionally rare. Let’s hope that we can blog about some “egg-citing” news in 2017.